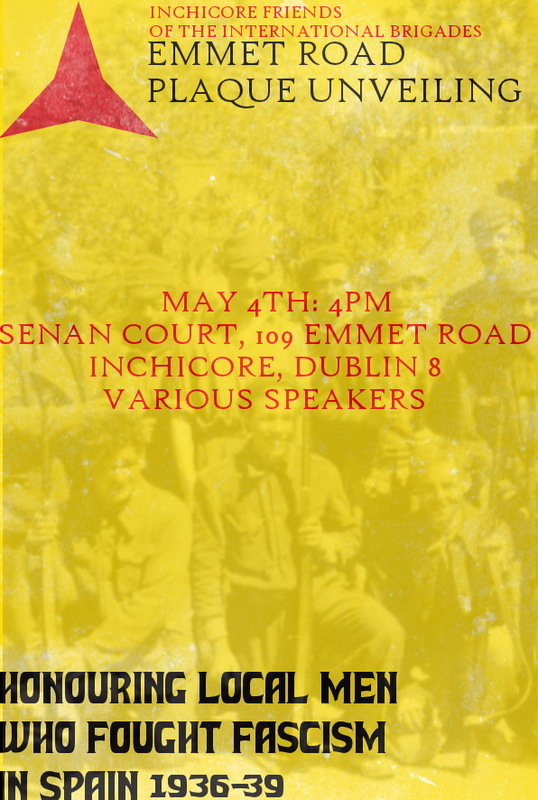 16.00, 4 May, at Senan Court, 109 Emmet Road, Inchicore, Dublin 8 (opposite Bulfin Road). 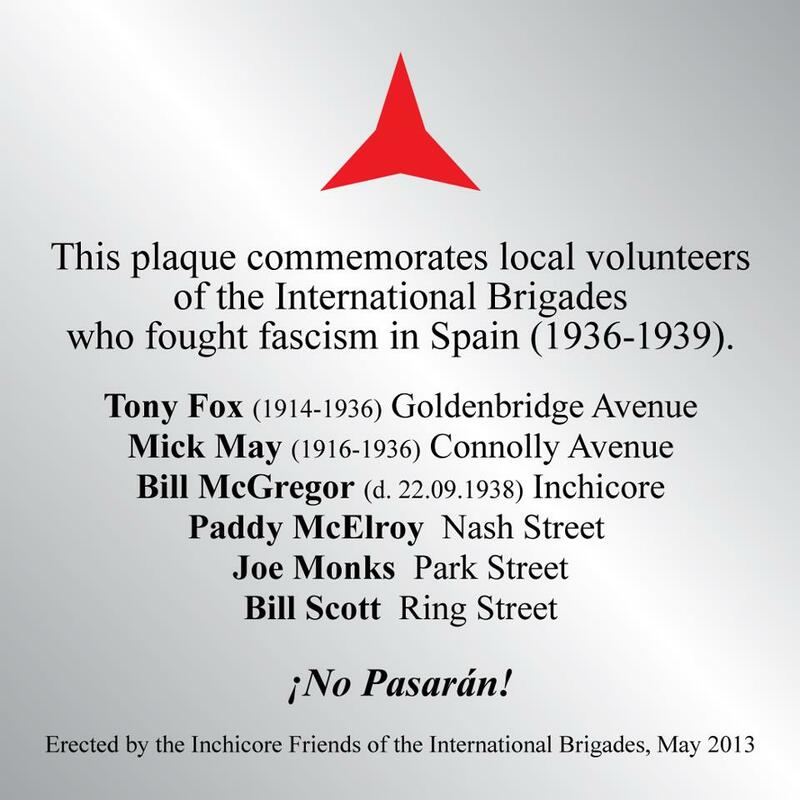 On 4 May, the Inchicore Friends of the International Brigades are erecting a plaque to the memory of six local men who went to Spain to defend the Spanish Republic against the military coup of July 1936. Posted by WorldbyStorm in Culture, Irish Politics, The Left, Uncategorized. A screening of the documentary Tadhg Barry Remembered will take place in the Triskel Arts Centre on Saturday 4th May 2013 at 2.30pm. Admission is free and all are welcome. This documentary tells the story of Tadhg Barry (1881-1921), a native of Cork city, who has largely been forgotten. It seems hard to believe that a man whose funeral closed shops and factories could be relegated to a footnote in history. And yet this is what has happened to a man who was one of the last people to be killed by British forces, just weeks prior to the signing of the Treaty. Tadhg Barry Remembered tells the story of Barry’s growing involvement in labour politics and the GAA in Cork. We learn of his poetic writings and his journalistic writings on GAA affairs and the labour movement. Through interviews with historians, trade union officials, the GAA and members of his family, we learn of his involvement in the ITGWU, in the advanced nationalist movement, how he was elected to the Cork Corporation in January 1920, only to be arrested a year later at a Corporation meeting and transported to an internment camp in Co. Down. Finally we learn of his tragic demise at the hands of a sentry in the Ballykinlar internment camp in Co. Down, just weeks before he would have been released following the signing of the Treaty. The documentary brings his story to life and also explores the historical context, which brought a young man who loved his country and who strived for equality and social justice to such a tragic end. It is an opportunity to honour his memory and to remove him from the footnotes to his rightful place in history. Tadhg Barry Remembered has been produced by Frameworks Films in collaboration with the Cork Council of Trade Unions for broadcast on Cork Community Television. It will first be broadcast on Cork Community Television (available on Channel 803 on UPC’s digital cable package) on Sunday 5th May at 8pm. The documentary was funded under the Sound & Vision scheme, an initiative of the Broadcasting Authority of Ireland. For further information contact Frameworks Films on 021-4322454. Posted by irishelectionliterature in Irish History, Republicanism, Video interview. This is the story of veteran Republican Liam Sutcliffe who joined the IRA in 1954. Within a few months he was an IRA agent in Gough barracks Armagh during `operation Harvest’. Sutcliffe later left the IRA and operated with the breakaway Joe Christle group during the 1950s Border campaign. In 1966, on the 50th anniversary of the 1916 Easter rising he was involved in an operation to blow up Nelson’s Pillar in O’Connell Street Dublin. In 1970 Sutcliffe joined Saor Eire. He was instrumental in organising the funeral in Mount Jerome Cemetery of Saor Eire member Liam Walsh, who was killed in a premature explosion at the rear of McKee army base in Dublin. So. Today is the day, or perhaps tomorrow, depending on reports in the media. Three doctors or four, or two. A ‘deal’ has been struck and the Protection of Maternal Life Bill 2013 will, presumably go forward. And it’s no small step either, even if deeply constrained. By the way, Peter Mathews performance last night on Vincent Browne was instructive, but not in a good way. Anyhow, reading the Irish Times yesterday morning and the contention that the abortion debate was becoming more ‘fractious’ on foot of the cod-revelations in the Sunday Independent on Sunday that – shock, swoon, some Labour TDs actually sought to move towards a ‘further liberalisation’ of abortion laws beyond X legislation, it struck me that the Constitution plays a strange role in all this. It is regarded as the rock upon which all else stands or falls – by the anti-abortion side and yet is also regarded, and this simultaneously, as somehow being unfit for purpose. How else to explain the dissonance evident in the views of many Fine Gael TDs on the matter (or sheer ignorance displayed on the VB show last night?). For example, we know that any measures to introduce legislation on foot of the X case today will be minimal enough, that there will be significant areas where even in the constrained provision of abortion that will become the status quo which will not be addressed. Mr Walsh said he fully supported the Taoiseach and the Government but he would be failing in his responsibility if he knowingly participated in the enactment of legislation that was fundamentally flawed. Yet his argument makes little sense if it is the Constitution that is the bedrock of curtailing abortion provision, and also, and this is more important again, that the Constitution as expressed by the relevant amendments represents the will of the citizens of this state. Because if the latter is correct then as long as legislation remains within the Constitution then it is indeed broadly representing the will of citizens. That doesn’t mean that legislation won’t be open to a challenge, but assuming they get it alright on the night the chances of any such challenges being successful should be limited. Moreover it is clear from successive Constitutional amendments that the citizens of the Republic are, shall we say, equivocal about matters some would prefer them not to be. When offered the choice to amend it in such a way as to exclude the threat of suicide they’ve resiled. As, is understandable. Of course in reality the Constitution is in no sense the hallowed document some might think in this discussion, but is instead a rampart or a buttress, there to be used when necessary and discarded when not. …John Deasy, Peter Matthews, Michelle Mulherin and James Bannon have expressed opposition to the inclusion of the suicide option. They have to, because all this proves is that it is perhaps beyond the wit of woman and man to provide ‘copper fastened’ legislation in matters such as this. For all the certainty expressed there will always be contention or grey areas. There’s another point that is worth noting about the Sunday Independent fracas. There seems to be an attitude abroad, as evidenced by the Independent itself running the interviews and some of the response to it, that politicians pushing a pro-choice line are somehow out of bounds, that his aim is in and of itself unreasonable or reprehensible. Minister of State for European Affairs Lucinda Creighton, the most prominent Fine Gael opponent of the plan to legislate for suicide, said the disclosure was worrying. “It is a matter of concern if that is the intent of the Labour Party,” she said. I find this inexplicable. Creighton knows that this is a democracy of sorts, and that in a democracy it is entirely reasonable for people to hold and propose views. She also knows – none better – the difference between personal views on a matter and the policy of a party. Her colleague, one L. Varadker, could explain that distinction in relation to issues of the public service etc. All Creighton has to do is to go to the Cabinet table and address the Tanaiste if she requires clarification on the matter. Granted the LP has been somewhat vague over the years on the issue, but its broad thrust of legislation for X and a sympathy towards the extension of abortion provision is hardly a massive secret. Or any secret at all. It’s probably not the party to join if you are a convinced anti-abortion advocate. So all of this is a bit amateur hour on drama night. But Creighton also knows, and again few better, that in order for any extension to abortion provision, beyond that allowed under X, would require a referendum. The practical politics of this are simply that it is vanishingly unlikely that any such referendum will be put before the Irish people under this government, or – I’d be willing to bet – it’s successor. So this too is entirely rhetorical. Her stand is, in some respects meaningless. Inclusion of suicidal ideation as a reason for permitting abortion is Constitutional. It has to be legislated for. it will presumably, whether six doctors or two, be ring fenced and made difficult to access. It does not lead to abortion on demand in the sense that term is used anywhere else. 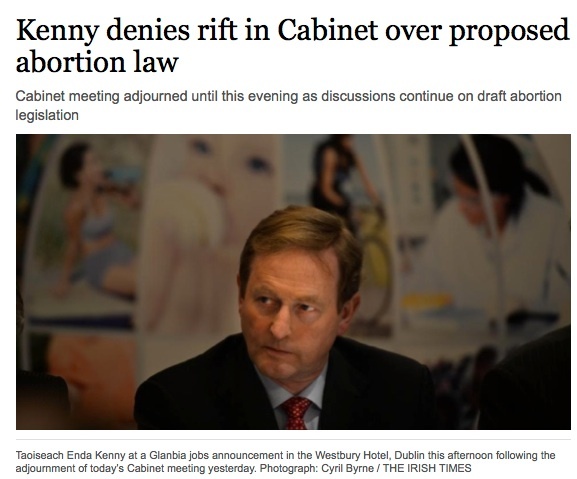 It is entirely possible that this provision will alter attitudes to abortion in this state. But attitudes have changed already and one suspects will continue to do so whether this is introduced now or not. Creighton knows precisely the room for movement on the issue at hand, what is possible, what isn’t possible and where a grey area may exist. It really is disingenuous of so many, but particular those in FG on the anti-abortion provision side, to pretend otherwise (it’s hardly worth adding that politically taking a pro-choice or anti-abortion approach is entirely valid – even if people disagree deeply, it’s how a view is presented that is the issue being addressed above). But it strikes me that politically this is very interesting. Watching people parade their consciences is hardly an edifying sight at the best of times, but is it possible that this time we’re seeing this parade being staged due to weakness (even taking into account the minimal nature of the provision noted above) rather than strength? One would have to hope so, no? … is the thought that comes to mind reading that Fine Gael TD, Brian Walsh, is willing to lose the Fine Gael whip over the proposed abortion legislation. He claimed his stance had the potential to end his career within the Fine Gael parliamentary party, “and probably the end of my political career, full stop”. …er… what exactly? Losing the whip? What’s the worst that can happen to the man? He can it is true be forced from the FG offices in the Dáil into the outer darkness of Agriculture House where the Independents and one or two LP apostates languish. Other than that, depending on whether there is room, he will suffer in no functional way whatsoever. He will remain a member of the FG party. He will, almost certainly, vote with the government in all votes (something that the LP dissidents don’t – for the most part). His suffering is hardly existential. And given that there’s a small left party’s worth of Labour TDs (and MEP) – or should that be a medium sized left party’s worth – who have already lost the LP whip and somehow the gesture seems… well… not very much at all. [who] said introducing a law on the suicide threat “was not something that should be done under the pressure of artificial deadlines”. Oh dear. It’s not as simple as right and wrong, at least not in that sense. But then one must echo Fintan O’Toole’s thoughts – granted not a man often quoted here for various reasons – that given what we are told the stakes are in relation to abortion it is remarkable how casual, on some levels, those against it actually are. If it is as ‘wrong’ as he suggests then why not bar pregnant women from leaving the state, or ban all information on the procedure, or… or could it be that this isn’t an issue that is amenable to such measures, whatever the rhetoric. And people know it. Remember, this man was our Taoiseach. Many thanks to Joan Collins for forwarding this to the Archive. This is an interesting document issued by the Socialist Party around 1998 which engages with issues around Women and Socialist Politics. 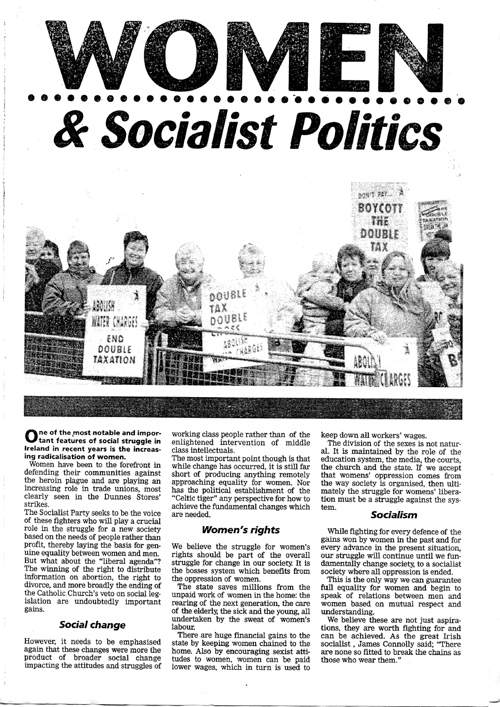 The introductory piece argues that given the ‘increasing radicalisation of women’ as a part of ‘social struggle’ and that ‘women have been to the forefront in defending their communities against the heroin plague and are playing an increasing role in trade unions, most clearly seen in the Dunnes Stores’ strikes’ that ‘The Socialist Party seeks to be the voice of these fighters who will play a crucial role in the struggle for a new society based on the needs of people rather than profit, thereby laying the basis for genuine equality between women and men’. It argues that the ‘liberal agenda’, that is ‘the winning of the right to distribute information on abortion, the right to divorce, and more broadly the ending of the Catholic Church’s veto on social legislation are undoubtedly important gains’, but it continues ‘however, it needs to be emphasised that these changes war more the product of broader social change impacting the attitudes and struggles of working class people rather than of the enlightened intervention of middle class intellectuals’. And it argues that ‘the most important point though is that while change has occurred, it is still far short of producing anything remotely approaching equality for women. Nor has the political establishment of the ‘Celtic Tiger’ any perspective for how to achieve the fundamental changes which are needed. It states that ‘we believe the struggle for women’s rights should be part of the overall struggle for change in our society. it is the bosses system which benefits from the oppression of women’. And it also argues that ‘while fighting for every defence of the gains won by women in the past and for even advance in the present situation, our struggle will continue until we fundamentally change society, to a socialist society where all oppression is ended’ which it argues is the only way of guaranteeing full equality between men and women. We believe that these are not just aspirations, they are worth fighting for and can be achieved. As the great Irish socialist, James Connolly said; “There are none so fitted to break the chains as those who wear them’. – Remove the constitutional ban on abortion. – Full family planning information and counselling to be provided free of charge through the health service. The Socialist Party stands for a truly secular democratic and socialist society. The Socialist Party stands for taking power out of the hands of the bankers, speculators and wealthy industrialists and transferring it to those who do the work and create the wealth, working class people. We stand for public ownership and democratic socialist planing of the key areas of the economic activity. Posted by WorldbyStorm in Culture, European Politics, The Left. ejh has returned after a break of some weeks. And it is a disturbing and thought-provoking piece on the nature and constraints of political language in the context of Spain and austerity, but with ramifications further afield.